I’d like to start by wishing Paulina a happy FOURTH birthday! 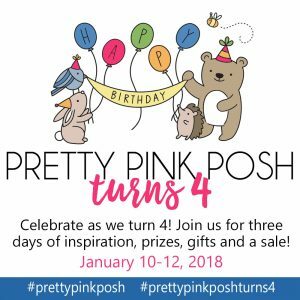 Yes, it’s her 4th year as Pretty Pink Posh, and I’m very happy for her – it’s not easy to keep a business afloat! #girlpower! 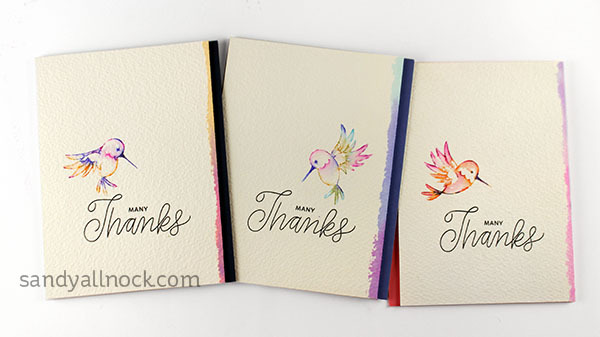 She sent me some of the new release, and I chose these really pretty little hummingbirds; they’re perfect for CAS cards with tiny little watercolored birds. I used Tombow markers, but you can try whatever water-based markers you have at home. (Don’t do this with alcohol markers, you’ll mess up your stamps!) Watch the video below or click HERE to see it in HD on YouTube. Here’s the list for today’s bloghop….enjoy! Your cards are beautiful. The hummingbirds are so cute and delicate. I would love to make these. Wow! What a BEAUTIFUL set of cards you’ve made! I’m just in love with that Hummingbird stamp set! I love how colorful yet CAS they turned out. Can’t wait until set is back in stock! Your cards are simple and beautiful! I don’t often say that because I am not a CAS kinda gal but you really make it look amazing!